We work with all types of flooring, whether you need tile & grout cleaning, carpet extraction, wood gym floor resurfacing, terrazzo, VCT, or concrete cleaning, sealing & finishing, we do it all. Email Us or call (877) FAGAN-4-U today to learn more. The gymnasium floor is often the showcase floor in your facility. What better way to make a good impression than to have it looking its best? Contact our team to complete your floor refinishing project. 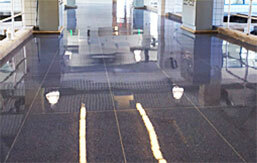 Terrazzo floors are made up of chips of marble, glass, or other aggregates imbedded into tinted concrete. They are beautiful, but they can be expensive. Let Fagan Sanitary Supply protect your investment! With our years of experience, we can restore your terrazzo to its original luster and provide you with a professional floor maintenance program.